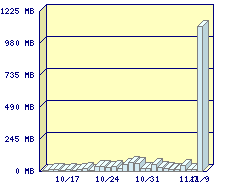 I knew while writing my blog entry for the Firefox 1.0 release that I’d see a spike in my bandwidth usage because of the large images I had in my post, but I didn’t expect anything like this! Thanks for dropping by and taking a look! I hope you took the hint and grabbed Firefox 1.0. According to my pair.com account manager, I pushed approximately 1.1GB of data yesterday, which is more than I’ve pushed before in any single month. For more detailed information, the Apache docs have good info for both 1.3 users and 2.0 users. Credit goes to yusufg for hooking me up with the above implementation. One can only wonder what my bandwidth graph would have looked like if every single person who viewed my blog entry hit the graphics. Not bad idea. However, not useful for comercial use, where every server hit counts! funtomas, you’re completely missing the point. This is especially useful for commercial use, because this is a way to cheaply minimise bandwidth usage. Companies care about page impressions, not hits on their web server. This is a way to have more page impressions with less resources. Hmmm, it’s a pity this module isn’t enable in a default Apache compile, I could make use of it. I guess I will have to try and remember it for the next upgrade.